Ballantines Finest. 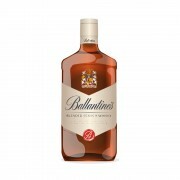 Produced in Dumbarton Scotland for Pernod Ricard. Their flavor profile is based off of a combination of 50 single malts and 4 single grains most notably Miltonduff and Glenburgie. Bought for an easy $20 as it was being phased off of the shelf at a college town liquor store. Nose: Immediately sweet with fresh white fruits (apples and pears) in a simple syrup, iced shortbread, barley malt, gently floral (non-specific), bits of toffee and more icing. Very sweet and expressive start. Body: Medium legs moving at a slower pace. Rich overall. Taste: Barley malt, caramel, fudge, red delicious apple slices, gentle forest notes in the form of forest floor. A bit of earthy peat. Finish: Lingers a bit. Soft and very smooth. No discernible burn. Some malt, a bit of fudge, and a light dusting of wet earth and wood ash. Overall: All of the place? Yes. It is also a blend. Enjoyable in that right? Yes. I like that it has a bit of everything there. Its fun that way. Not sure if Id score this a 96 (2014) by Mr. Murray but I couldn't complain if this was at a bar.